Among the concepts proposed by Althusser in the course of his famous symptomatic reading of Marx’s Capital, structural causality plays a central role. Extrapolated from Marx’s writings via a detour through the philosophy of Spinoza, it came to represent the concept in which Althusser summed up ‘Marx’s immense theoretical revolution’. As is well known, for Althusser, by breaking with the other two models of causality available in Marx’s time (the mechanistic causality derived from Descartes and the ‘expressive’ causality derived from Leibniz and above all Hegel), ‘structural causality’ made it possible for the first time to think of history as a process deprived of any essence and telos, without subject and without end – or, as Althusser puts it in another formulation, as a ‘structure of structures’ without any centre. It was, therefore, the concept that condensed the antihumanist reading produced in the 1960s by Althusser and his collaborators, one that soon became famous under the label ‘structural Marxism’. In this article, I argue that Althusser’s concept of structural causality cannot be reduced to a metaphysical necessitarianism of Spinoza’s kind or a structuralist determinism. My aim is to show that, far from being a strictly determinist concept, structural causality was the concept through which Althusser attempted for the first time to develop a logic capable of including contingency as a structural dimension, and that, far from asserting the timeless reproduction of the structure (i.e. of a certain mode of production), it should be read as the concept through which Althusser tried to propose a non-dialectical theory of structural change. Now, it is well known today, after the publication of Althusser’s late writings, that he proposed in the 1980s a new philosophy for Marxism that he named materialism of ‘the encounter’ or of ‘the swerve’. However, I do not intend to project the problematic of the late Althusser onto his theories of the 1960s. I will take an opposite approach and attempt to show that ‘structural causality’ was, in fact, the site of Althusser’s effort to flesh out a new way of thinking about the interrelation of necessity and contingency in history, rooted in a long-standing preoccupation with the notion of ‘necessity’ that can be dated as far back as the late 1940s. In order to do so, I will proceed via a reading of some crucial moments of the early Althusser (that is, Althusser before the 1960s), so as to show his attempt both to deconstruct and to reconstruct the notions of necessity that he found in Hegel and the orthodox Marxism of the 1950s. I will then move on to a ‘symptomatic reading’ of structural causality itself as conceptualized in Reading Capital and as developed, in the months after the publication of the book, in some posthumously published texts. What is important here is that for Althusser, while Capital provides us with a new ‘transcendental analytic’, the transcendental itself is not the Träger of any metaphysical necessity, but only of what he calls a ‘de facto necessity’. This perspective, which aims to abolish the ontological separation between the transcendental and the empirical (and which could be called ‘empirical transcendentalism’), implies a new, ‘weaker’ conception of necessity bound up with an ‘articulated historical structure’ that both conditions and is conditioned by the ‘manifold that it conditioned’. The dissertation ends precisely on this problem of an adequate conceptualization of ‘necessity’ in Marxism, which Althusser resolves through the concepts of ‘de facto necessity’ and ‘empirical transcendentalism’, although they are left largely undeveloped. However, this attests that the concept of necessity was very much at the core of his preoccupations and that it was also the central concern, from as early as 1948, of his relationship with Marxism. Furthermore, it shows that it was by reflecting on this question that Althusser introduced, well before For Marx, the idea of a break between the early Marx and the Marx of Capital. The same concerns with the category of necessity in Marx and Marxism are present in at least three other writings from the 1950s. In the course of the lectures on the philosophy of history that he gave during the 1950s at the ENS, for example, Althusser grapples with the question of history as a closed or open process. The central idea is, again, that what distinguishes Hegel from Marx is that Hegel can only think of history as a ‘closed’ process – that is, from the point of view of the Spirit reconciled with itself at the end of the historical unfolding. By contrast, Marx provided us with the means to conceive of history as an open process. In this course, Althusser abandons the idea of an ‘empirical transcendentalism’ and shows a more rigid orthodoxy. For instance, when discussing the issue of the laws of history, he relies quite heavily not only on Lenin but also on Stalin, and states that ‘it is the functional nature of the relations of production that allow us to comprehend the necessity of the transition from determinate social conditions to different ones, i.e. revolutions’. However, the course is particularly interesting because it shows the central tension in Althusser between the exigency of orthodoxy, leaning towards the ‘iron laws of history’, and the need to come up with a less simplistic conception of necessity than the one provided by the dogma. The solution that Althusser introduced here is in more than one sense much less interesting than the one he outlined in his dissertation. In the attempts to limit the validity of the ‘laws’ discovered by Marxism, he appeals to an ‘inexhaustible reality’ that precedes the science of history and ‘always surpasses it’. Such an appeal must be read as an attack on the idea of absolute knowledge; that is, as a passage levelled against the idea that Marxism is a philosophy of history stating laws that are valid once and for all. The obvious problem is, however, that such an appeal to the need of rectification of the outcomes of scientific research stands in contrast to, or at least in a problematic relationship with, the very idea of the ‘necessity of the transition’ that Althusser nonetheless maintains. If history is not reducible to a ‘law’, and if there is always a sort of ‘excess’ over the conceptualization of it, how can one argue that there is something like a ‘necessity of the transition’? This shows perhaps the difficulties that Althusser was facing in those years of almost strict orthodoxy. But it also shows that even in those years he was at odds with the Marxist (or Stalinist) conception of necessity, and somehow attempted to correct it though an operation of Ptolemization that, instead of calling into question the central tenets of a theory, was content to add epicycles in the hope of making things work. A further step – and indeed a decisive one – in this direction is taken by Althusser in his book on Montesquieu, written a few years later – crucially, after 1956.24 In this work, which shows a degree of independent thinking comparable to the dissertation on Hegel (to which in a sense it returns), Montesquieu is seen as a direct precursor to Marx in that ‘he was the first person before Marx who undertook to think history without attributing it to an end, without projecting the consciousness of men and their hopes onto the time of history.’  More importantly, Montesquieu became for Althusser a means to develop a new schema of historical causality based on the idea of ‘multiple determinations’. In this sense, Althusser’s reading of the Ésprit des lois can be seen as the attempt to develop a new concept of complex necessity. Thus, the very dialectics between principle and nature is sustained by another causality that encompasses a whole set of heterogeneous factors. The concept of ‘encounter’, introduced here for the first time, will soon become central to Althusser’s attempt to come up with a notion of causality capable of mediating or, better said, capable of articulating, necessity and contingency. The issue of contingency is certainly not present at this point, even if the idea of ‘encounter’ or ‘conjunction’ is introduced to displace the idea of a mechanical or expressive necessity commanding the unfolding of a dialectical totality. The concept of structural causality will inherit and radicalize these issues, introducing the question of the relationship between necessity and contingency to the very heart of Althusser’s recasting of Marxism. The expression ‘necessity of contingency’ is here mobilized against the idea of a simple and continuous teleology of reason, which Althusser (arguably a little hastily) attributes to the philosophy of Enlightenment and to Hegel. It is likewise opposed to what we can call a ‘logic of expression’, for which Althusser wants to substitute a ‘logic of production’. This opposition is, indeed, revealing. Given that, in For Marx and especially in Reading Capital, Althusser criticizes the concept of ‘expressive causality’ for its reductionism of the elements of a determinate ‘whole’ to an inner essence or principle, arguing for the new type of causality represented by ‘structural causality’, we have here the indication that ‘structural causality’ occupies the conceptual space indicated by the phrases ‘necessity of contingency’ and ‘logic of production’. It is certainly strange that Althusser does not bring structural causality itself into the discussion at this point. However, it is clear that we are confronted here with a decisive substitution: ‘necessity of contingency’ plays the role that will be taken on by structural causality, which will be opposed to the ‘expressive whole’ (that is, to a logic of expression) and to the Leibniz–Hegelian ‘expressive causality’. Nonetheless, immediately after proposing this category of ‘necessity of contingency’, Althusser fails to flesh it out. What is worse, he never mentions it again in Reading Capital, not even when, in chapter IX, he develops the concept of structural causality. We are confronted, at a textual level, with a problem: the ‘enigma’ of the ‘necessity of contingency’ – this category of which we are only told that ‘it clashes with the classical system of categories’ – seems to direct us to the concept of ‘structural causality’ (to which the opposition to the ‘logic of expression’ points), and yet ‘structural causality’ undeniably relies on the Spinozist concept of immanent causality, and for Spinoza ‘in rerum natura nullum datur contingens’;35 in Althusser’s conceptualization of structural causality the problem of contingency is never mentioned per se. Notwithstanding this lexical problem – which I take here as a symptom – the opposition that we stressed suggests that structural causality is associated by Althusser himself with the category of ‘necessity of contingency’, and therefore, in some way or another, Althusser considers the issue of contingency as central to his attempt to recast Marxism on the basis of the category of structural causality. Following this textual symptom, the problem is to understand how and if Althusser, in his elaborations of structural causality in Reading Capital, effectively manages to incorporate the ‘necessity of contingency’, and where precisely this incorporation can be found. Here, a certain displacement is needed with respect to the usual way of reading the concept of structural causality, which (when it isn’t dismissed as simply metaphysical or deterministic) insists on a certain tension between a Lacanian idea of the ‘absent cause’ and a more Spinozist model of an immanent causality). To be sure, this formulation (‘oblique perspective’) is quite obscure, and the fact that Althusser suppressed the passage in the second edition attests that he was aware of that. However, it is clear that Althusser intends to limit the idea of an absent cause to a certain perspective, and this move has the effect of limiting the validity of metonymic causality: the risk that Althusser sees in the idea of an absent cause is that it reintroduces surreptitiously an idea of transcendence by referring to an absence that would automatically be conceived as a ‘beyond’. Nonetheless, the priority attributed by Althusser to the presence of the cause in its effects does not mean that within structural causality, absence does not play any role. The crucial consequence that Althusser draws from this conception of differential time is that the concept of ‘present’ must be radically reformulated. Althusser substitutes for the idea of the present as an ‘instant’ the concept of ‘conjuncture’, which becomes the name of the ‘present’ within the framework of structural causality. The present is not a simple moment, but is in itself a complex moment, ‘a time of times’, a time whose characteristic is to be ‘nonpresent’ to itself. As such, the idea of a complex and multiple present has an important consequence. On the one hand, it opposes the idea, which is linked by Althusser to the empirical conception of time (of which the model is Aristotle’s Physics), according to which time is a linear succession of instants that are in themselves simple; on the other, it also refuses the idea that each present of the ‘whole’ is a ‘full’ present, a present where all the elements coexist expressing one another. In this passage, the notion of absence is clearly admitted. There is, however, a crucial difference with respect to the absence that we find in ‘metonymic causality’. First, we must note that Althusser refers to a system of absences, rather than to the absence of a cause. Whereas for Miller the absence is the absence of the structure, Althusser is emphasizing the plurality of the absences, which correspond to the different and intertwined structures making up the complex of structural causality. Second, these ‘absences’ here are a function of the presence. It is not, in other words, an absence that is transcendent with respect to presence: ‘absence’ is the name of the ‘non-contemporaneity’ of the conjuncture – and not its principle of organization. Therefore, according to this passage, for Althusser any absence is always a function of presence, or, better said, the plurality of absences is the modality of the presence of the whole. It is probably useless to point out that this reading of Rousseau, which, as always in Althusser, complements his reading of Marx,  pushes the concept of structural causality at the greatest possible distance from any idea of a logical or metaphysical necessity and stands in contrast to both Spinoza’s and Hegel’s necessity: there is neither a teleological necessity, nor a logical one. It is clear that Rousseau, among the authors he is in dialogue with at this time, provided Althusser with the purest example of a thought that promoted contingency – through the notions of ‘encounter’ and ‘accident’ – to the rank of what is determinant in the last instance in the transition from one ‘phase’, ‘structure’ or ‘mode of production’ to another. Contingency is not, as it was for Spinoza and for Hegel, an epistemological weakness of human knowledge; it is ontologically constitutive of history. 1. ^ L. Althusser and É. Balibar, Reading Capital , trans. Ben Brewster, Verso, London and New York, 2009, pp. 200–214 – henceforth RC. This is the translation of the second French edition of Lire le Capital, which included only Althusser’s and Balibar’s contributions in a revised version. In the course of this article I will refer to some passages of the first edition, available as L. Althusser et al., Lire le Capital , PUF, Paris, 1996 – henceforth LC. The English translation of the first edition, L. Althusser et al., Reading Capital: The Complete Edition , trans. Ben Brewster and David Fernbach, Verso, London and New York, 2016, had yet to be published when this article was written. 2. ^ RC, p. 17. 3. See A. Schmidt, History and Structure: An Essay on HegelianMarxist and Structuralist Theories of History , trans. Jeffrey Herf, MIT Press, Cambridge MA and London, 1981; E.P. Thompson, The Poverty of Theory and Other Essays, Merlin, London, 1978. 4. ^ Structural causality has been fiercely opposed by Hindess and Hirst in A. Cutler et al., Marx’s Capital and Capitalism Today, vol. 1, Routledge & Kegan Paul, London, 1977, p. 222ff. Laclau and Mouffe criticize Althusser’s Spinozist rationalism in Reading Capital in E. Laclau and C. Mouffe, Hegemony and Socialist Strategy: Towards a Radical Democratic Politics, Verso, London, 1985, pp. 98ff. 5. ^ Cf. P. Anderson, Considerations on Western Marxism, Verso, London, 1976, cited in P. Thomas, ‘Philosophical Strategies: Althusser and Spinoza’, Historical Materialism, vol. 10, no. 3, 2002, p. 80. 6. ^ See Thomas, ‘Philosophical Strategies’, p. 80. Cf. G. Elliott, Althusser: The Detour of Theory, Haymarket Books, Chicago, 2009. p. 150. 7. ^ See the writings col ected in L. Althusser, Philosophy of the Encounter, trans. G.M. Goshgarian, Verso, London and New York, 2006. 8. ^ L. Althusser, ‘On Content in the Thought of G.W. F. Hegel’ , in The Spectre of Hegel, trans. G.M. Goshgarian, Verso, London, 2014, pp. 17–172 – henceforth OC. 9. ^ Cf. the judgement of F. Matheron in the presentation of the first volume of L. Althusser, Écrits philosophiques et politiques, vol. I, ed. F. Matheron, STOCK/IMEC, Paris, 1994, pp. 13, 17 – henceforth EPP I. Matheron’s thesis is confirmed by G. Rametta, to whom we owe, to my knowledge, the most thorough reading of Althusser’s dissertation on Hegel. See G. Rametta, ‘Il contenuto è sempre giovane. La tesi su Hegel del giovane Althusser’, in G. Rametta, Metamorfosi del trascendentale. Percorsi multipli da Kant a Deleuze, Cleup, Padua, 2008, pp. 85–114. 10. ^ ‘The Hegelian concept is pure interiority … “The self has no outside” … The Hegelian concept is the movement through which the result recovers its origins by internalizing them; by revealing itself to be the origin of the origin. This process of envelopment implies that the initial term and the reflected term are aufgehoben in the result: that is, preserved and justified.’ OC, pp. 82–84, 94. 11. ^ ‘The concept pretends to externalize itself and posits differences which are, apart from its act of positing them, nothing at al , and which are therefore not real, but accidental … in order to grasp the insubstantiality of their substantiality, we need to look at things through the eyes of God, who sees the differences men seek desperately to experience disappear even before they have come about. To discover this reassuring [apaisante] perspective we have to situate ourselves, by means of philosophy, at the origin of the concept.’ OC, pp. 135–6. 12. ^ Ibid., pp. 142, 148. 13. ^ Ibid., p. 170. 14. Ibid., p. 168; my emphasis. 15. ^ Ibid., p. 167. 16. Ibid., p. 170. 17. See ‘Les problèmes de la philosophie de l’histoire (1955–1956)’, in L. Althusser, Politique et Histoire de Machiavel à Marx. Cours à l’École normale supérieur 1955–1972, ed. François Matheron, Éditions du Seuil, Paris, 2006, pp. 33–160 – henceforth PH. 18. ^ PH, p. 152. In this course, the ‘break’ between Hegel and the whole tradition of the philosophy of history and Marx hinges on the dichotomy closure/openness. 19. ^ Ibid., p. 179. 20. Ibid., p. 171. 21. L. Althusser, ‘Sur l’objectivité de l’histoire’ , in Solitude de Machiavel et autres textes, ed. Yves Sintomer, PUF, Paris, 1998, p. 28. 22. ^ Ibid., p. 26. 23. In the course on the philosophy of history Aron is cited several times. Althusser had read his Introduction à la philosophie de l’histoire (Gal imard, Paris, 1948) in 1953. According to F. Matheron and Y. Ichida, his notes on Aron’s book show that Althusser was particularly interested in the notion of hasard that Aron found in Cournot – a fact that confirms that Althusser was interested in developing a concept of causality capable of addressing the issue of contingency already in these years. See F. Matheron and Y. Ichida, ‘Althusser, un “typapart” une bibliothèque à part?’, Le Temps Modernes, vol. 664 no. 3, 2011, p. 206. 24. ^ L. Althusser, ‘Montesquieu: Politics and History’ , in Politics and History: Montesquieu, Rousseau, Marx, trans. Ben Brewster, Verso, London and New York, 2007, pp. 13–112 – henceforth MPH. 25. ^ MPH, p. 50. 26. Ibid., p. 45. 27. Ibid., p. 54. 28. ‘What is indeed remarkable in these factors, which either determine the very nature of the government (e.g. geographical extent, climate, soil) or a certain number of its laws, is the fact that they only act on their object indirectly’ (MPH, p. 55). In the 1956 course on the philosophy of history to which I referred above, Althusser argued that these factors determine directly the nature of the government, representing a mechanical causality (PH, p. 48). This shift in the reading of Montesquieu is crucial. 29. ^ G.M. 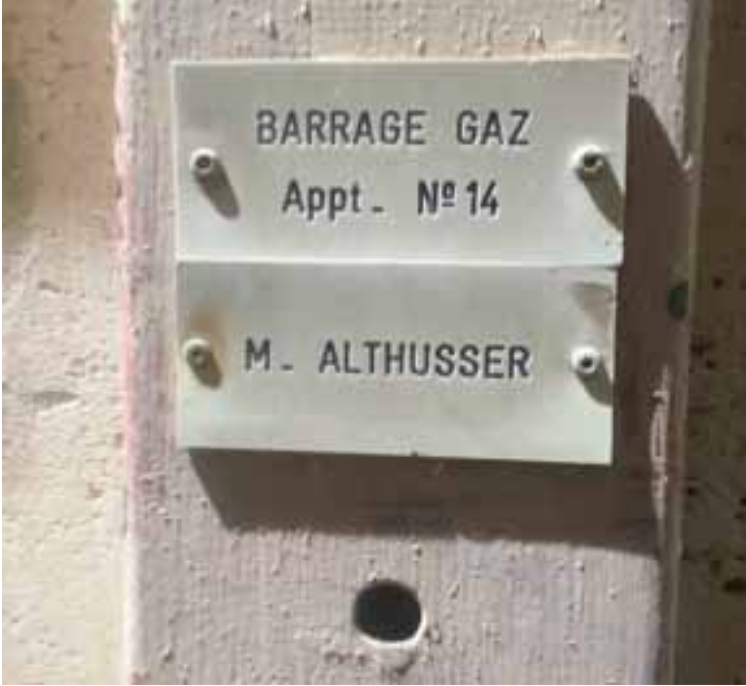 Goshgarian drew the attention to Althusser’s use of the term ‘encounter’ in his book on Montesquieu in his ‘The Very Essence of the Object, the Soul of Marxism and Other Singular Things: Spinoza in Althusser 1959–67’, in K. Diefenbach et al. (ed. ), Encountering Althusser, Bloomsbury, London and New York, 2013, pp. 89–111 (see pp. 90–94). 30. ^ MPH, p. 56, trans. modified. 31. ^ I take into account here only Althusser’s contributions. 32. ^ Cf. for instance RC, p. 133, where Althusser argues that ‘the project of a structural history poses serious problems’, as in structuralism (more accurately, in Lévi-Strauss) the destructuration and restructuration of the synchronic is down to ‘accidents’ that happen for purely ‘contingent reasons’ that can only be thought as pure ‘miracles’. Yet this passage should be understood more as a critique of the opposition between necessity (structure) and contingency, rather than as a critique of contingency per se. Althusser’s critique is here level ed against the structuralist idea that the synchronic is self-contemporaneous and internally undifferentiated; thus, the transition from a certain structure to another (which is the concern of structural history) could only be explained by appealing to a contingent event coming from outside the structure itself. As we shall see, Althusser’s theory of ‘necessity of contingency’ wil rely on the internal ‘non-coincidence’ of the ‘structure’ with itself. 33. ^ RC, pp. 47–8; my emphasis. 34. ^ ‘The rationality of the philosophy of Enlightenment to which Hegel gave the systematic form of the development of the concept is merely an ideological conception both of reason and of its history’ (RC, p. 47). Althusser examines this continuity at length in ‘Les problèmes de la philosophie de l’histoire (1955–1956)’, pp. 33–160. 35. ^ Spinoza, Ethics, I, Proposition XXIX. 36. ^ It was Étienne Balibar who was the first to draw attention to the notion of ‘underdetermination’ in Althusser. See his ‘Avant-propos pour la réédition de 1996’, in L. Althusser, Pour Marx , La Découverte, Paris, 2005, p. xi i. 37. ^ ‘Let us assume the presence of an element that turns back on reality and perceives it, reflects it and signifies it, an element capable of redoubling itself on its own account … From the moment that the structure involves the element we have mentioned: – its actuality becomes an experience or experiment; – the virtuality of the structuring [le structurant] is converted into an absence; – this absence is produced in the real order of the structure: the action of the structure comes to be supported by a lack. The structuring [le structurant], by not being there, governs the real.’ J.-A. Mil er, ‘Action de la structure’, Cahiers pour l’Analyse 9, 1968, pp. 93–105; English translation: http:// cahiers.kingston.ac.uk/pdf/cpa9.6.mil er.translation.pdf. 38. ^ ‘By means of what concept is it possible to think the new type of determination which has just been identified as the determination of the phenomena of a given region by the structure of that region? More general y, by means of what concept, or what set of concepts, is it possible to think the determination of the elements of a structure, and the structural relations between those elements, and al the effects of those relations by the effectivity of that structure? And, a fortiori, by means of what concept or what set of concepts to think the determination of a subordinate structure by a dominant structure; in other words, how is it possible to define the concept of a structural causality?’ RC, pp. 205–6. 40. ^ On this, see also the analyses developed by Y. Sato in his remarkable Pouvoir et résistance, L’Harmattan, Paris, 2007, pp. 173 ff., to which I am indebted. For a different reading, see W. Montag, Althusser and His Contemporaries, Duke University Press, Durham NC and London, pp. 81–100. 41. ^ RC, p. 101–31. 42. ^ RC, pp. 110–11. It is important to note that in this chapter the notion of a determination in the last instance by economy does not play (contrary to what Laclau and Mouffe suggested) any conceptual role. Althusser always refers to the totality of the levels. 43. RC, p. 118. 44. Cf. L. Althusser, Essays in Self-Criticism, trans. Graham Lock, NLB, London, 1976, p. 187. 45. ^ If we compare this reciprocity and its consequences with the way in which overdetermination was introduced in For Marx (and especial y in ‘Contradiction and Overdetermination’ and ‘On the Materialist Dialectic’), it seems that, by introducing the underdetermination, Althusser is stressing that the relations between the levels cannot be reduced to the logic of the conditions of existence. Effectively, in those two essays the overdetermination of the economic contradiction was due to the superstructures being also the conditions of existence of economy itself. But in ‘Contradiction and Overdetermination’ Althusser also said that for the main contradiction to be activated an intervention of ‘currents’ foreign to the task of revolution was needed (L. Althusser, For Marx , trans. Ben Brewster, Verso, London, 2005, p. 99). Now, on the basis of overdetermination, how are these ‘paradoxical y foreign’ currents understandable? It may be said that the concept of underdetermination accounts for the existence, in the social whole, of elements and currents that are not reducible to the status of conditions of existence; the various levels or instances (thus, the various contradictions), are certainly for Althusser also the conditions of existence of the economic level, but they are not only that. Each and every level has its own history and time, which is subject to a torsion by its articulation upon other levels, but is also relatively independent; the degree of its torsion is not forever determined or determinable in advance. 46. ^ RC, pp. 115–16. 47. ^ L. Althusser, ‘Letters to D.’, in Writings on Psychoanalysis , ed. Oliver Corpet and François Matheron, trans. Jeffrey Mehlman, Columbia University Press, New York, 1996, pp. 33–78 – hereafter LD. 48. ^ LD, p. 61. 49. L. Althusser, ‘On Genesis’, Décalages, vol. 1, no. 2, 2013. Available at: http://scholar.oxy.edu/decalages/vol1/iss2/11.Thisbrief [archive] text was meant to be another letter to Diaktine. 50. ^ RC, p. 317. 51. PH, p. 308. 52. Of course, in Rousseau, Althusser does not find the concepts of overand under determination. What I am suggesting is that he finds in Rousseau a model that stresses the moment of the ‘contingent taking hold’.